You can make your own simmering scents for pennies on the dollar. Anything goes! This year I bought spices in bulk from a Mennonite store, where a bag of 100 whole cloves cost 99 cents. Then we throw our apple and orange peels in the pot as they accumulate. 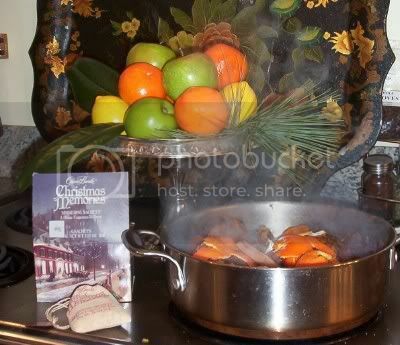 Sprinkle with nutmeg, powdered cinnamon or a cinnamon stick, throw in a few cloves, and fill the pot 2/3 full of water. Bring to a boil, then turn the heat down to a low simmer. If you prefer to use less electricity, you can simmer in a crockpot with the top removed. I turn off the heat after about 20 minutes of simmering, yet the scent lingers for hours. Don't empty your pot after each use. Keep adding water, peels, and spices as many days as you like. Never let the pot run dry. Use an old pot if you have one, as the mixture leaves a hard-t0-scrub residue. I know fresh fruit is healthy, but it's kind of expensive for a family of six. Where do you find the chepest fruit? We have been going through a tangerine eating phase here and I told my husband to save the peelings after reading this post. :-) It smells great! I have made this for several years, but only used apples and spices. Thanks for the frugal ideas. By the way, congratulations on the award. I love your blog! Thanks, Mary Ann! We are enjoying the fresh tangerines here, too. Take care and I absolutely love this blog! Your fruit arrangement is beautiful. Meridith, you have a great "eye" for still life arrangement. So glad you posted this and I stumbled across it! :) Our climate is VERY dry and my husband was telling me his mom would simmer pot pourri on the wood stove when he was a kid...so we just started saving orange and tangerine peels about 3 days ago, and now I have an idea how to put it together. Thanks!